Late last week, I received a package of pretty fat eighths in the mail from the Coquette line by Chez Moi for Moda. 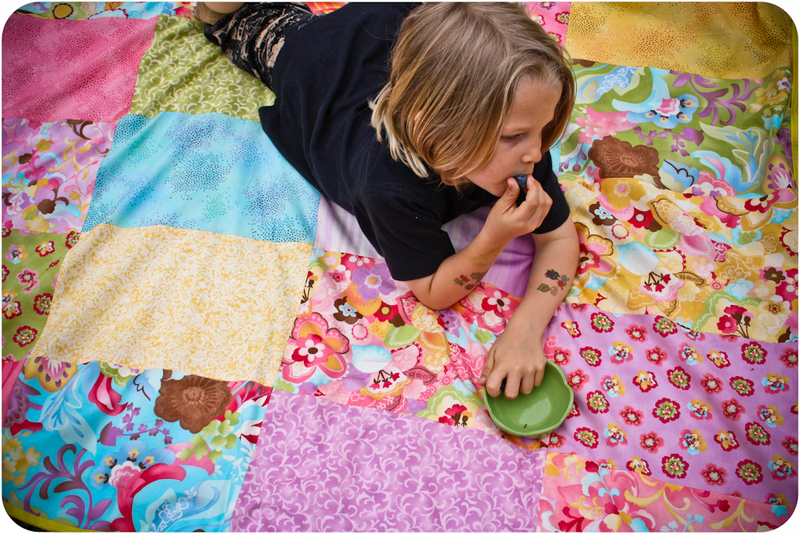 I must have been in the zone with this project because 2 days later, the picnic quilt was finished. Backing up a bit, about 3 years ago, I made Soulemama's Beach Blanket to Go from Handmade Home. That blanket is loud, well-loved, and growing a bit too small to hold all of the children in our family who have grown so leggy. 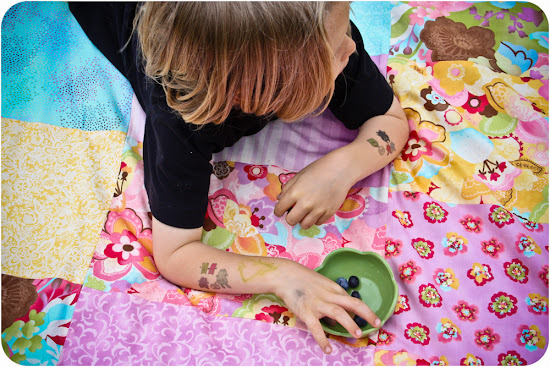 As I thought and planned what I might like the next picnic blanket to look like, I began thinking of pretty, summery fabrics that would bring a smile to my face. When I found the set of fat eighths in Coquette on etsy, they were exactly what I had in mind. Of course, Soulemama's tutorial calls for strips of fabric in 12.25"x30", and I certainly wasn't going to get that from a fat eighth! I decided to cut each fat eighth at the 15.5" mark making the pieces 9"x15.5". I used a total of 28 different fat eighths, making the quilt 4 rectangles across by 7 rectangles down. This made the total quilt top very close to the 60"x60" size that the original was. On the same day I finished the quilt top, I decided to try my hand at thrifting for an appropriate backing. 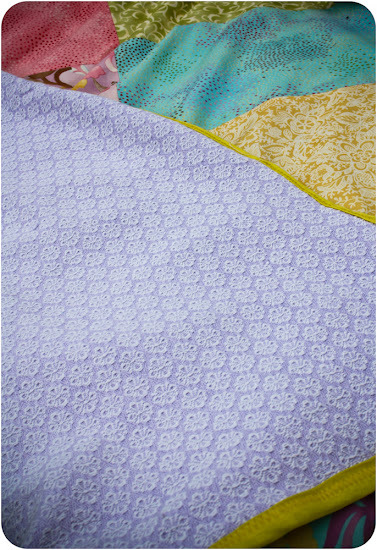 I envisioned a woven cotton vintage bedspread as the backing for this quilt instead of the vintage sheet I used last time. Thrifting and I have a love/hate relationship. I almost never find what I'm looking for, and rarely even find something I want. This time however, I found exactly what I wanted at the first stop! Well, actually it had a small hole that I had to work around and it's a bit faded in the middle, but who's quibbling. 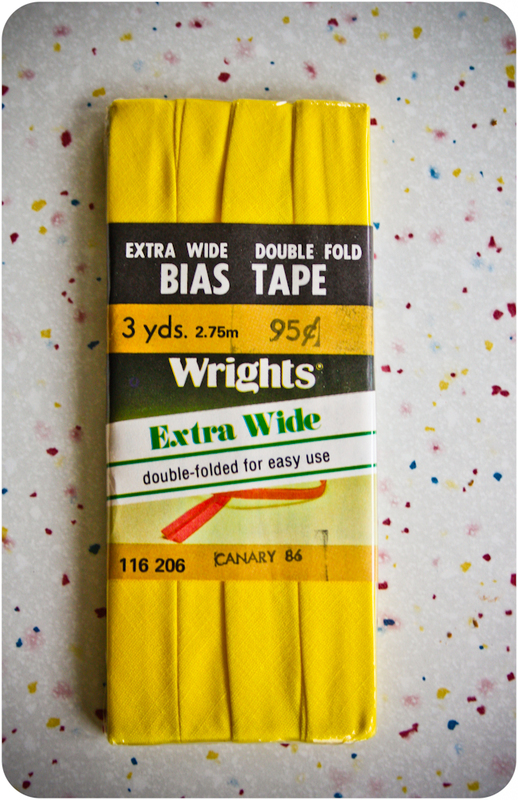 I just have to share the bias tape that I found for this project as well. 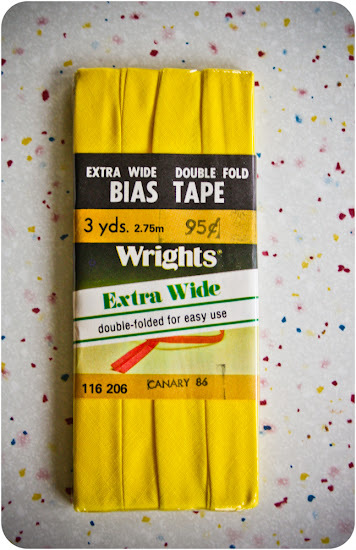 I bought 6 packs of 3 yards each for less than $5 on etsy. A great deal in my estimation made even better by the smile it brought to my face when I saw the 80s advertising and font. With the leftover almost 4" by 9" scraps that I had after cutting each rectangle for the quilt, I made flags for this bunting that will likely grace our camping tables and shelters this summer. Of course, just to add a wee bit of frustration into the mix, I ran completely out of canary yellow thread exactly 6 flags from the end of the bunting, on both the spool and the bobbin! So back to the fabric shop I will go for another spool for this negligible amount of sewing left to be finished. Love the brightness and cheerful prints. bunting always brings smiles, doesn't it ?~! Loving the bright spring colors! Gorgeous! Both the picnic blanket and Finn. 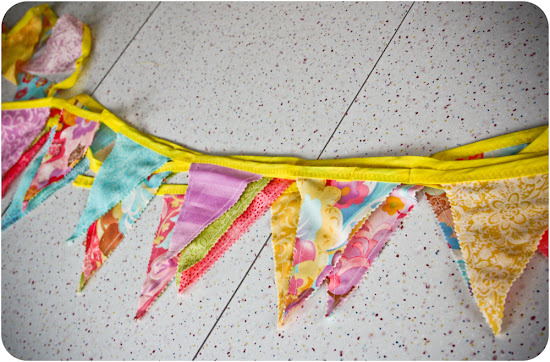 What a great idea to use bias tape for a bunting. 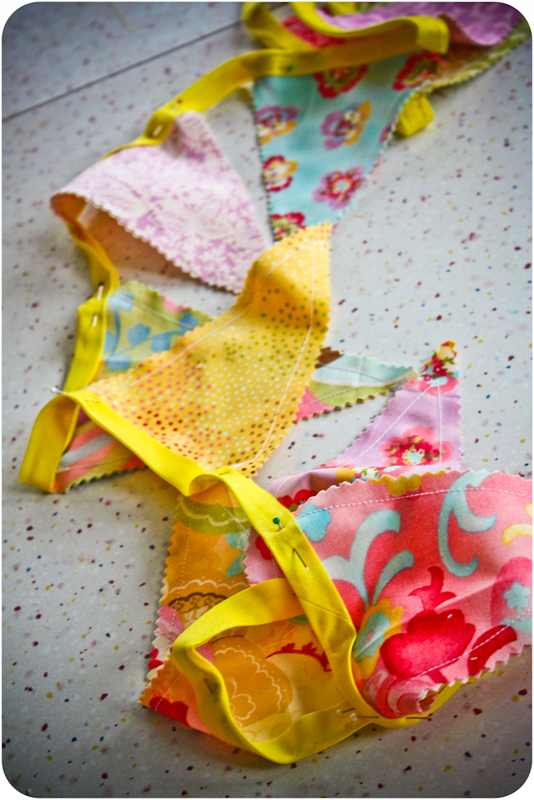 What a lovely blanket and bunting, how frustrating that you ran out of thread so close to the end! that blanket is rockin'! seriously i love it! 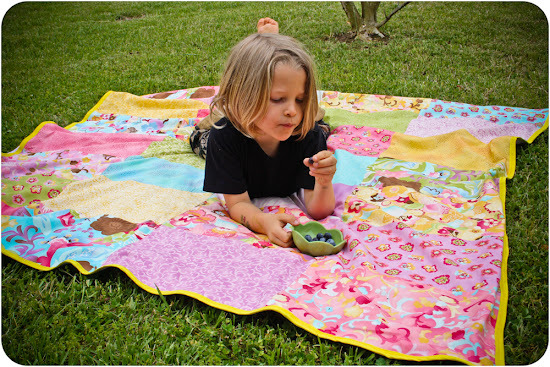 and i am so inspired to make a picnic blanket for us. thank you!